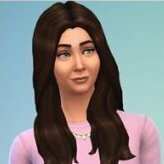 I'm Sailfindragon aka Deborah and a custom content creator for the Sims. I tend to hibernate in Photoshop for extended periods of time and on occasion come out with new walls, floors and, patterns. I am also known to create new meshes for our sims, but don't always have the time anymore. I hope you enjoy using my custom content as much as I love making it. Unfortunately, I don't/can't take requests. UPDATED: (05/03/17) to include custom swatches. The Fabulous FHRA requested opposite versions of the Painted Wood Half Wall Panels. White panels with colored moldings. I thought that would be really cool, so I obliged. Yeah, who am I kidding, any excuse to dive back into Photoshop! As always each wall is compatible with all 3 wall sizes. Walls can be found in Build Mode-> Paint or Panelling Category ->- Cost: 2. Like my other creations, this is a custom texture made by me. So, if there’s a color I have not included within this set that you would like to see in your game, feel free to let me know and I will see what I can do. This is the second of nine sets of Geometric Pattern Sets I am currently working on. There are 5 unique patterns per set, each having a small version, 10 patterns in total. I have used quite subtle default colors for this set. But each pattern has two recolorable channels, which will enable you to color with your own palettes. The set consists of; A single tall window A double tall window A single short window A double short window A single small window Each window has 3 recolorable parts, so there is plenty of options for styling. There are 4 variation colors included with each window. Well, my pattern obsession seems to know no bounds. lol. Poor photoshop! Another one of my old patterns updated! The Stone Tile pattern has three recolorable channels and can be found in the tile/mosaic category. Hope you enjoy. As always if you have any issues, please do not hesitate to let me know. Trinity Framed Wall Mirror. Contains one recolorable channel. File includes six color variations. Enjoy and Happy simming. This is the Freeman Dining Chair. I originally made this chair years ago. I have learned a lot since then and thought it would be a perfect opportunity to update it. The Freeman Dining Chair has been completely remapped and new textures added. The chair has two recolorable parts. The legs which come in 6 different wood textures and the main chair. I have included 6 color variations in this too. Cherry Blossom Wall Set consists of 18 walls with 8 color variations in a variety of grey wood moldings. Kick plates, Mid height panels, and high panels.